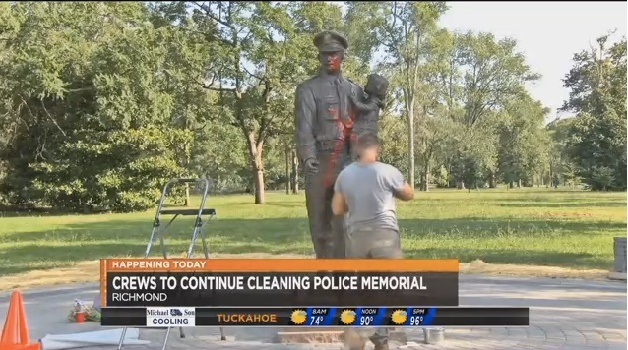 Crews are expected to continue to clean up the vandalized Richmond Police memorial. Police are still investigating after the statue was vandalized late Tuesday night. As of Thursday morning, the statue was covered with a tarp and blocked off with orange cones to keep people away. Initially, someone spray painted the words "Justice for Alton" on the ground, which has been cleared. However, there is still more work to be done, NBC 12 TV reports. It is believed whoever did this was undoubtedly angry over the shooting death of Alton Sterling, who was killed in an officer-involved shooting in Baton Rouge, LA, last week.